When Ulran and Cobrora Fhord left Lornwater on their quest to resolve the mystery of the red tellars (Floreskand: Wings), the city was ripe for rebellion against King Saurosen, holder of the Black Sword. 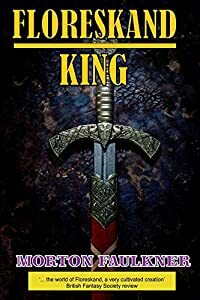 In charge of the Red Tellar Inn, Ulran’s son Ranell is drawn into a conspiracy with nobles to support Prince Haltese, the king’s heir, to overthrow the tyrant. Inevitably, as a mining disaster and a murder in a holy fane stoke the fires of discontent, open rebellion swamps the streets. Conflict turns into civil war, where the three cities’ streets become a battleground. Conflict is not confined to Lornwater, however. There’s fighting below ground in the mysterious tunnels and caves of the Underpeople, and within the forest that surrounds the city, and ultimately in the swamps and lakes of Taalland. Subterfuge, betrayal, conspiracy, intrigue, greed, revenge and a thirst for power motivate rich and poor individuals, whether that’s Lord Tanellor, Baron Laan, Gildmaster Olelsang, Lord-General Launette, ex-slave-girl Jan-re Osa, Captain Aurelan Crossis, Sergeant Bayuan Aco or miner Rujon. Muddying the fight are not only bizarre creatures – the vicious garstigg, the ravenous lugarzos or the deadly flensigg – but also the mystics from the Sardan sect, Brother Clen, Sisters Hara, Illasa and Nostor Vata. At stake is the Black Sword, the powerful symbol that entitles the holder to take the throne of Lornwater.